4. It can become the catalyst for a Church-Planting movement. A missionary can plant a church, but God’s plan is for church-planting movements (Acts) and that is unlikely to be accomplished except through national believers. 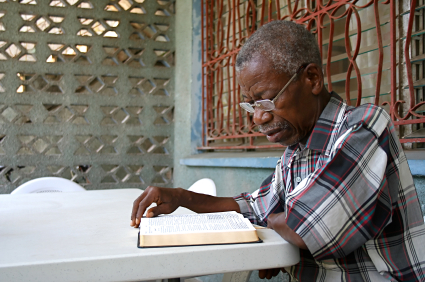 It is practically impossible to send a church-planter without putting into his hand a Bible he can read in his own language. 5. It will allow national pastors to proclaim truth with authority. How long can a preacher say, “This is what the missionary told me the Bible says?” How far will his ministry go if he is armed with only the truths he learned in the missionary’s Bible institute? How strong can the church become in the doctrines of the Bible? National pastors can proclaim the truth in a real and penetrating way that speaks directly to the people in their culture. They can do it in a way the missionary never could unless he remains in the culture for many years. But they can only do it with the authority of God’s Word behind them. How are the truths of propitiation, repentance, grace, atonement, justification, forgiveness, sanctification and holiness to be taught without putting it into the language of the people? 6. It will become the means of maturing the Churches. What will happen when false teachers come? Where will the churches look for protection? Will they be expected to refute falsehood from only the memory of what they were taught? What will promote and preserve the doctrinal purity of the church? In Acts 20:17-35 during Paul’s last visit with the leaders of Ephesus he addressed these issues. He spoke of the threat of false teachers in verses 29-30. He spoke of the church being built up in verse 32. In the absence of Paul’s preaching and leadership, what did he leave them as a source of protection and help? In the 18 verses recording this last meeting, Paul made 9 references to the Word of God or the preaching of the Word. In verse 32, Paul was left with no choice but “to commend you to God and to the word of his grace which is able to build you up.” The safety of the church will not come from what they learned 10 years ago, but it will come from the Word. The only thing that will stand the test of time and be there long after the missionary’s influence is gone is the Word of God. As the church studies God’s Word, they will begin to apply Biblical theology to difficult or controversial matters. Issues such as the church’s position on polygamy that is common in many Muslim cultures and many tribal groups and the church’s reaction to tribal warfare can be handled Scripturally if the church has the source of truth. Syncretism (blending of religions) is a common problem among churches without the Word of God. What is to stop the tendency of some to return to the acceptance of certain idols, charms or fetishes that permeated their cultures for centuries if we do not give them the Word of God? Sikhism is a blend of Islam and Hinduism. Many of the Muslim cultures of Africa and Central Asia are blends of Islam and Animism, spirit worship, demonic rituals and witchcraft. Without the translated Scriptures, the church is not exempt from this danger of syncretism.